With shades of Scott Westerfeld’s Uglies and Ally Condie’s Matched, this dark, cinematic dystopian novel—the first in the thrilling Eye of the Beholder series—is set in a near future society in which 'right' and 'wrong' are manifested by beauty and ugliness. In Grace Luther’s world, morality is physically enforced. Those who are 'good' are blessed with beauty, while those who are not suffer horrifying consequences—disfigurement, or even death. When the cleric’s daughter stumbles onto information that proves her world is more complicated than it seems, she finds herself at the center of an epic battle where good and evil are not so easily distinguished. Despite all her efforts to live a normal teenage life, Grace is faced with a series of decisions that will risk the lives of everyone she loves. With each minute, Sarah Tarkoff masterfully tightens the screws in this electrifying debut novel that plunges us into a nightmarish and all too plausible future. Full of high-drama and pulsating tension, Sinless explores essential questions teenagers wrestle with every day: What is beauty? What is faith? Where does friendship end and love begin? Do we take our world at face value and accept all that we have been taught—or do we question the mores of the society into which we are born? 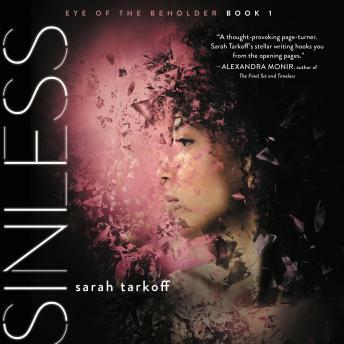 Chilling and thought-provoking, Sinless is essential listening for fans of The Hunger Games, Divergent, The Maze Runner, The Giver, and Delirium.